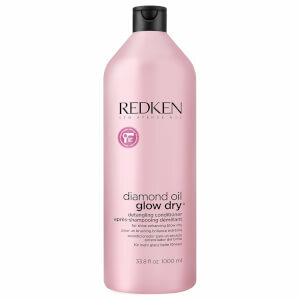 Add mirror-like shine to your locks with the Redken Diamond Oil Glow Dry Shampoo; a lightweight, radiance-renewing formula that works to cleanse and revitalize. 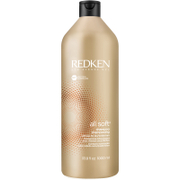 Fortified with Amla Extract and Coriander Oil, the luxurious shampoo gently eliminates impurities and product build-up, while rejuvenating and restoring luminosity from root to tip. 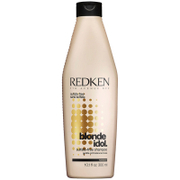 Tresses are soft, sleek and glossy without added weight. 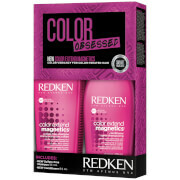 Apply to wet hair, message into lather and rinse. Follow with Detangling Conditioner and Blow Dry Shine Oil. In case of contact with eyes, rinse them immediately. Aqua/Water, Sodium Laureth Sulfate, Citric Acid,, Cocamidopropyl Betaine, Glycerin, Sodium Hydroxide, Sodium Chloride,, Hexylene Glycol, Parfum/Fragrance, Sodium Benzoate, Salicylic Acid,, Polyquaternium-10, Peg-40 Hydrogenated Castor Oil, Coriandrum Sativum, Seed Oil/Coriander Seed Oil, Caprylic/Capric, Triglyceride, Linalool, Sodium Acetate, Isopropyl, Alcohol, Phyllanthus Emblica Fruit Extract, (D192492/1).